America Makes, the National Additive Manufacturing Innovation Institute, announced today that the University of Dayton Research Institute has been awarded a Directed Project Opportunity. At a press conference this morning in the Center for Innovation in Additive Manufacturing at Youngstown State Univresity, U.S. Rep. Tim Ryan joined officials from UDRI, YSU and America Makes to discuss the significance and impact of the award on Northeast Ohio, where half of the 25 project team’s partners are located. UDRI is the principal investigator on the project, and YSU is the co-leader of the technical efforts. 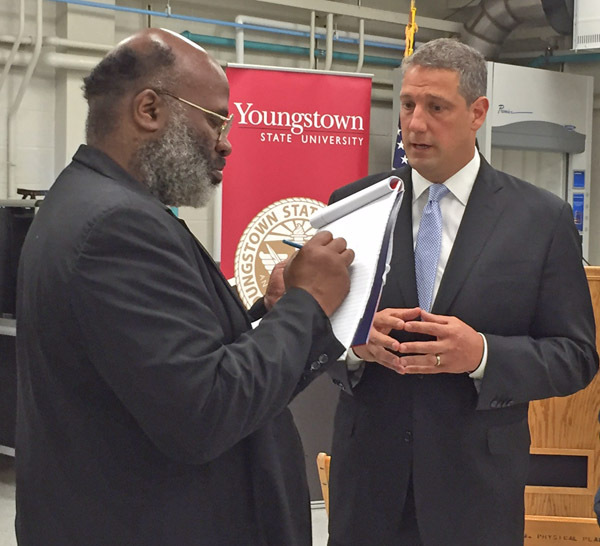 U.S. Rep. Tim Ryan talks with Raymond Smith, reporter with the Tribune Chronicle in Warren, after the news conference in the Center for Innovation in Additive Manufacturing in Moser Hall on the YSU campus. In attendance at press conference was Ralph Resnick, NCDMM President and Executive Director and America Makes Founding Director; U.S. Rep. Tim Ryan; John E. Leland, Ph.D., P.E., Vice President for Research and UDRI Executive Director; Jim Tressel, YSU President; Youngstown Mayor John McNally; and representing the 910th Air Wing from the Youngstown-Warren Air Reserve Station, Ohio, are: Col. James D. Dignan, Col. David C. Post, SMSgt Michael Birmingham, and SMSgt Phil Aliberti. UDRI was initially notified as the awardee at a special, America Makes members-only event held in April on the campus of the University of Dayton where the entire project team, along with America Makes personnel and Air Force officials, gathered for the award of this important AFRL research. M-7 Technologies, Slice Manufacturing Studios, and Youngstown Business Incubator along with the Air Force Life Cycle Management Center (AFLCMC) and AFRL out of Dayton and the 910th Airlift Wing out of Youngstown. Also joining the Ohio-based project team are other additive manufacturing leaders, including 3D Systems Corporation, American Foundry Society, Boeing Company, Honeywell International Inc., Lockheed Martin, the National Center for Manufacturing Sciences, Optomec, Pennsylvania State University, Raytheon, and the University of Northern Iowa. 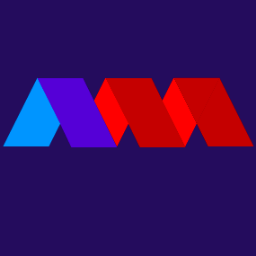 America Makes is the National Additive Manufacturing Innovation Institute. As the national accelerator for additive manufacturing (AM) and 3D printing (3DP), America Makes is the nation’s leading and collaborative partner in AM and 3DP technology research, discovery, creation, and innovation. Structured as a public-private partnership with member organizations from industry, academia, government, non-government agencies, and workforce and economic development resources, we are working together to innovate and accelerate AM and 3DP to increase our nation’s global manufacturing competitiveness. Based in Youngstown, Ohio, America Makes is the flagship Institute for the National Network of Manufacturing Innovation (NNMI) infrastructure and is driven by the National Center for Defense Manufacturing and Machining (NCDMM). For more information about America Makes, visit http://americamakes.us. Headquartered at Wright-Patterson Air Force Base, Ohio, the Air Force Research Laboratory was created in October 1997 with the mission to lead the discovery, development, and integration of warfighting technologies for our air, space, and cyberspace forces. AFRL employs approximately 10,000 military and civilian personnel. It is responsible for managing and annual $4.4 billion (Fiscal Year 2014) science and technology program that includes both Air Force and customer funded research and development. AFRL investment includes basic research, applied research and advanced technology development in air, space, and cyber mission areas. For more information, visit http://www.wpafb.af.mil/AFRL/. The University of Dayton Research Institute is a national leader in scientific and engineering research, serving government, industry and nonprofit customers. Established as the research arm of the University of Dayton in 1956, UDRI performed more than $98 million in sponsored research in fiscal year 2015. The University of Dayton Research Institute is ranked third in the nation among all colleges and universities for sponsored materials research, according to the National Science Foundation. In Ohio, UDRI is number one among nonprofit institutions receiving contracts and grants from the Department of Defense. For more information about UDRI, visit www.udri.udayton.edu. 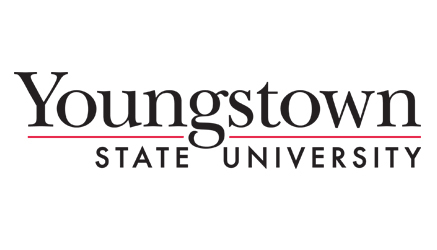 Youngstown State University is a comprehensive urban research university that offers nearly 13,000 students more than 135 undergraduate and graduate programs backed by a strong tradition of teaching, scholarship, and public service. As a major educational and economic development resource in the region, YSU is known for its focus on academic research and creative programs that transform its students into successful professionals, scholars, and leaders. Located in the heart of the Tech Belt between Cleveland and Pittsburgh, YSU provides opportunities for students to actively participate with accomplished faculty on advanced research and creative collaborations. YSU’s College of Science, Technology, Engineering, and Mathematics is home to the Center for Innovation in Manufacturing and the Ph.D. program in Material Science and Engineering.